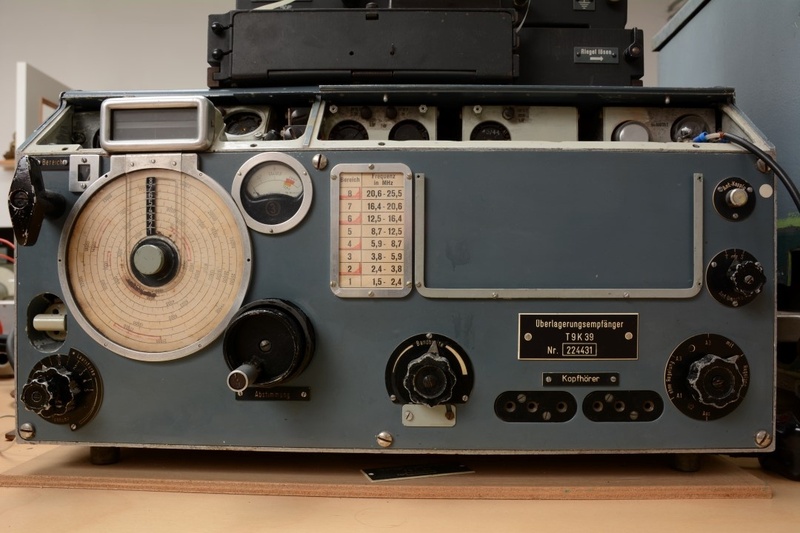 The T9K39 "Main" high-frequency U-boat receiver was a late-war development to replace the aging E437S. Although originally intended for the type XXI boats, it saw service in late-war-built type VII and type IX U-boats. *The T9K39 operated in the 1.5 to 25.5 mHz range divided into 8 bands. The front hinged panel on this unit is folded back revealing a built-in test circuit for tubes that enabled rapid checks of the voltage appearing at each tube. The voltage was read on the small circular dial just to the right of the large tuning dial.